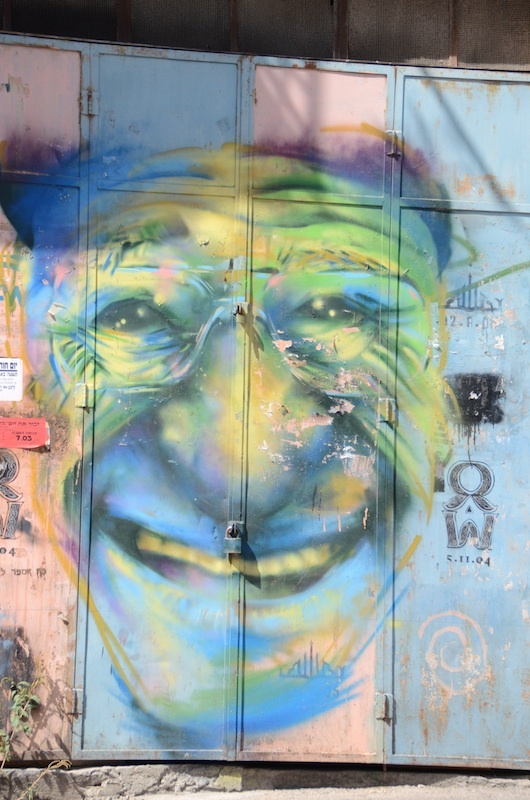 This is mostly a pictorial tour of Mahane Yehuda market in Jerusalem, from my visit last summer. I wish I had more time that day to leisurely explore and photograph. It is a foodie and photographer's heaven. 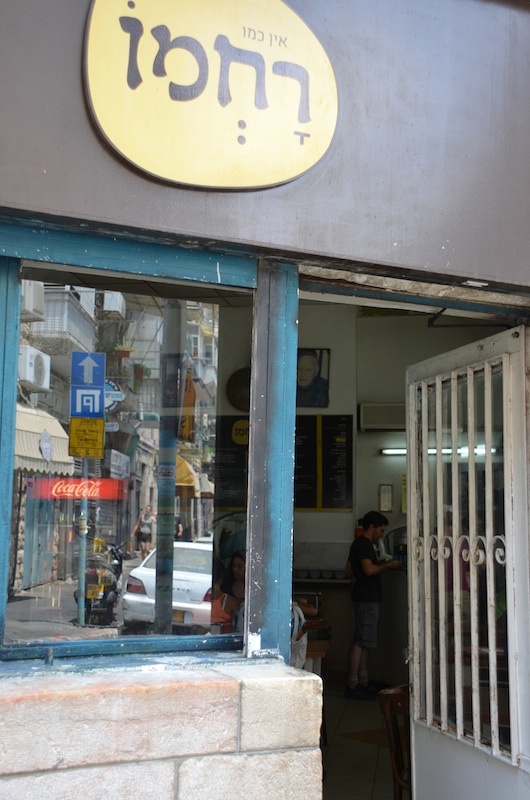 Rahmo restaurant רחמו is a must pit stop for its hummus and Iraqi food. 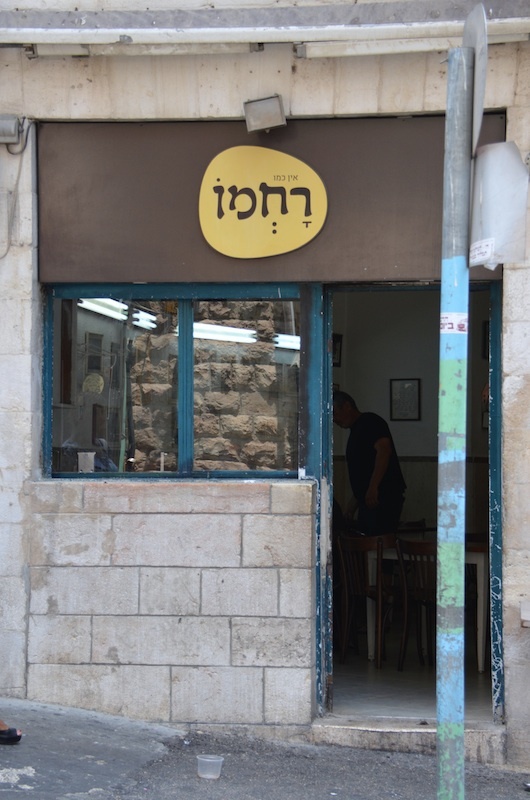 The tables are always humming with diners, casual stop for the most authentic experience in the famed market that is a Jerusalem landmark. 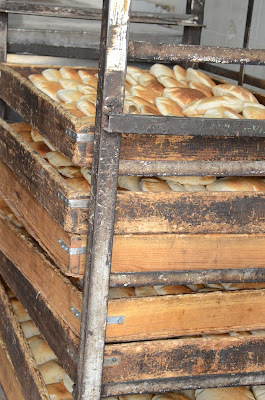 Just across the alley-street from Rahmo, you will find Hatzpuriya חצ'אפוריה (photo below), a Georgian bakery, Georgia as in a part of the former Soviet Union. 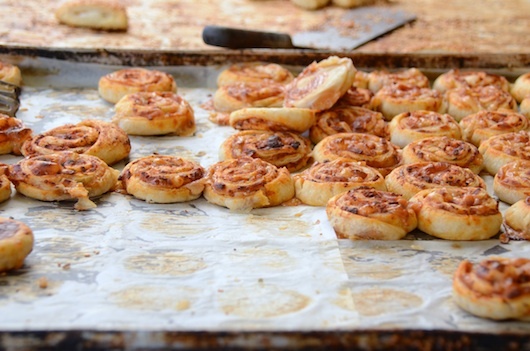 Savory pastries filled with Georgian cheeses and other fillings. A great snack on the go. 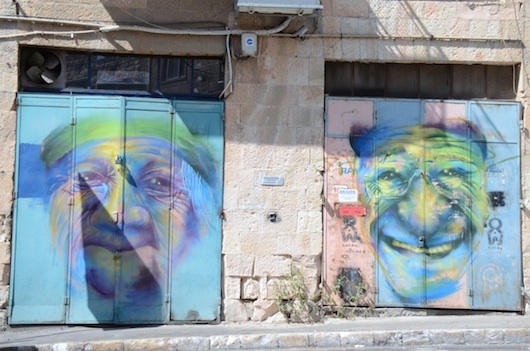 Throughout Mahane Yehuda market you will find these murals painted everywhere. 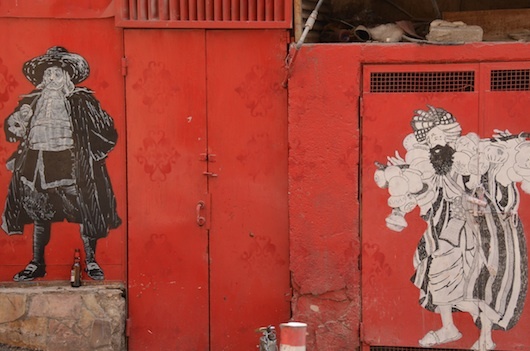 I am planning on going back on my next visit, hopefully, to explore the alleys, streets and do some more photography. 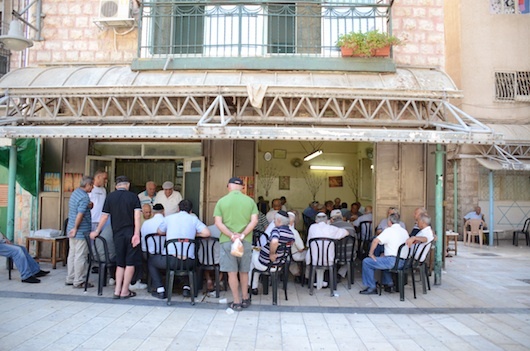 An Iraqi neighborhood in Mahane Yehuda market. Elderly men leisurely playing rounds of backgammon. 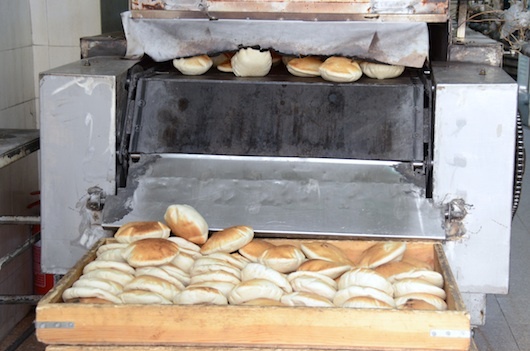 Two of these top pita photos you might have seen me tweet from Israel. 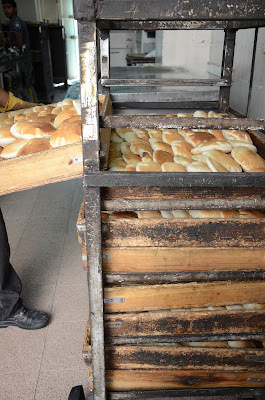 I love the rustic, well seasoned, wooden crates they transfer the pitas into for transport. 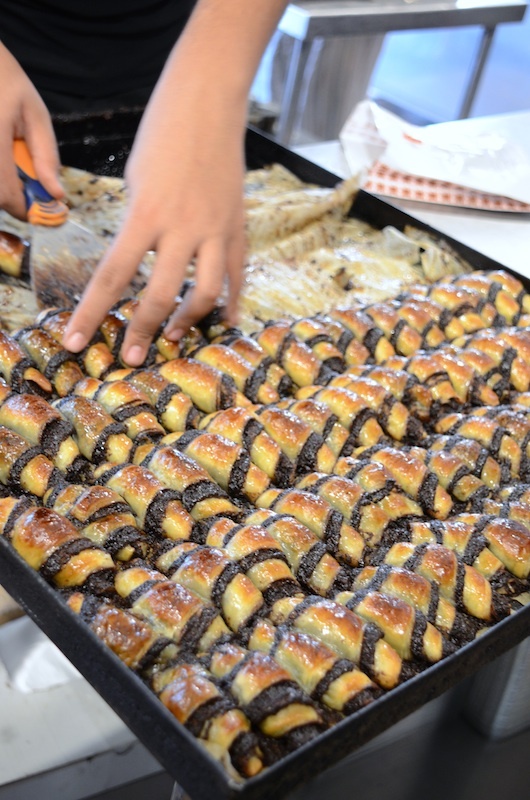 The two photos below are taken at Marzipan Bakery in the shuk (market). The rugalach at Marzipan came in at number 16 on The 2008 Saveur 100 List. 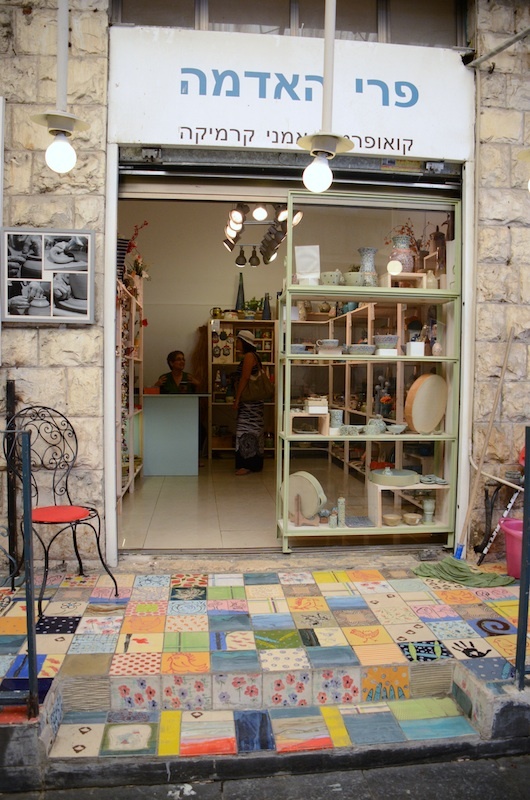 A charming ceramics artist cooperative shop name Pri HaAdama (fruit of the earth) in Mahane Yehuda market. Great handmade food photography props. Thanks to Inbal of Delicious Israel for the tour of Mahane Yehuda market. 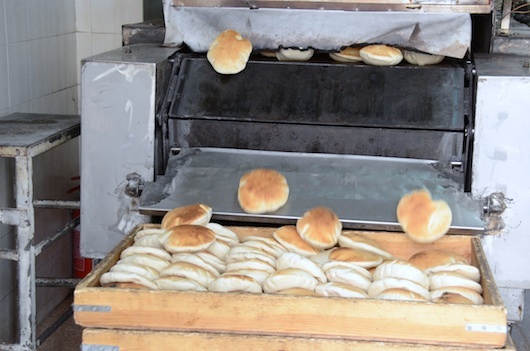 Oh my goodness those pitas look positively irresistible!! I'm really enjoying your travel posts! Lovely places! Those baked goodies look ever so mouthwatering. Thank you for these moving photos. I love Jerusalem, place of Salem, Shalem, "peace." May peace reign, and may you be blessed for all the gifts you share bravely and lovingly. I love each and every photo! 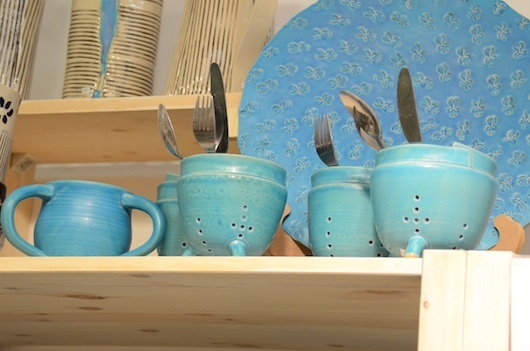 Genuine, rustic, authentic... Thank you for taking us on this wonderful tour! 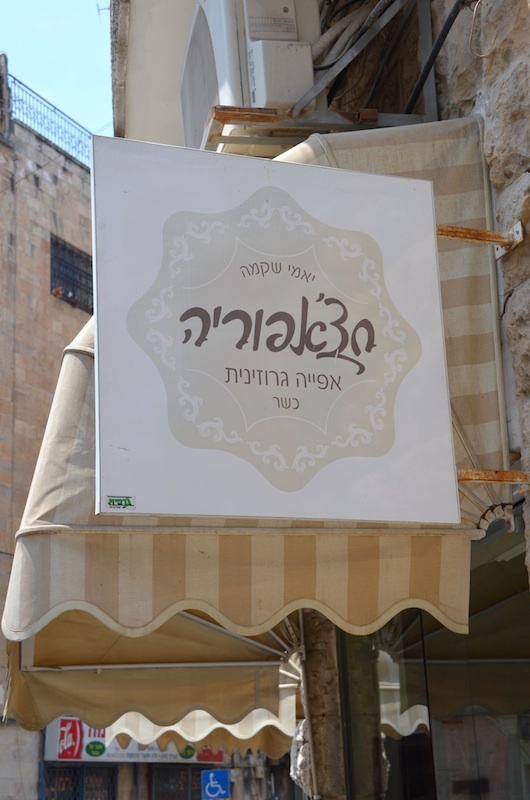 What a lovely tour of Mahane Yehuda market. It is one of my favourite places to visit when in jerusalem . I love Teller's bakery and always get their incredible sourdough bread with dried blueberries and pecans. Thanks for taking me down memory lane.